Relax in the Pines, Horseshoe Pit and Pet Friendly! 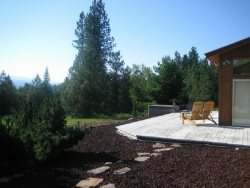 This rustic Garden Valley vacation rental is dog-friendly, offers space for up to 11, and is near golfing, motorcycle and ATV trails, fishing, whitewater rafting, and the mellow Middle Fork of the Payette. When the day is done, soak in the endless stars and the geothermal pools and hot tub just down the road. Perfect for your weekend getaway, family reunion, or motorcycle trip! At meal time, gather around the dining table with space for six, and whip up a frenzy in the fully-stocked kitchen. When the weather is fine, dine outdoors - sliding glass doors lead right out to the wrap-around patio. This Payette River Hideaway features one bathroom, one bedroom, and a spacious loft for a small group (up to 7 people), or, for an additional $50.00/night expand into the guest house for access to the garage, a 2nd bathroom, and a 2nd bedroom. With the guest house, you can have up to 11 travelers total. Sleeping options include two queen-sized beds, a twin-bed, and two hide-a-beds in the main cabin, plus two hammocks in the loft. A queen bed and a futon await you in the guest house. A washer and dryer is also included so you can pack light! Best of all, the cabin is heated by geothermal water so no matter how deep the snow, the cabin is warm and cozy year-round. Outside, this home is secluded by pine trees and offers an elevated wrap-around deck on the main cabin and two decks in the bedroom above the garage. The sprawling yard is ideal for up to two dogs, though a pet fee will apply. This cabin is tucked away - please note that cell service is spotty out here – which will allow you to reconnect to each other. You are just 15 minutes to white water rafting on the South Fork of the Payette and 25 minutes to the Main Fork of the Payette River. After just a few hours you’ll love our Payette River Hideaway like we do – and like us, you won’t want to leave! Karen was very helpful, friendly and accommodating. Loved It! I would stay there again!